I returned from new York last Sunday to discover this campaign from Europcar had cropped up all over London. For those of you not in London, the basic premise is that Europcar’s new service “FreeDeliver” will save you time, essentially giving you an extra hour in your day to do with as you will. I first saw this campaign on a fairly standard panel on a train and noticed at the bottom it suggested that I should twitter what I would do with #myextrahour. My initial reaction was somewhat cynical “Really? People are going to bother tweating about Europcar? and are Europcar’s audience really on Twitter anyway?”. I believe that social media can be a powerful force in the right campaigns, but it has to be an organic process. Surely the UK public aren’t going to fall for this are they? But the general commentary amongst my peer-group was pretty positive and when I looked into it, this was a well structured media campaign. 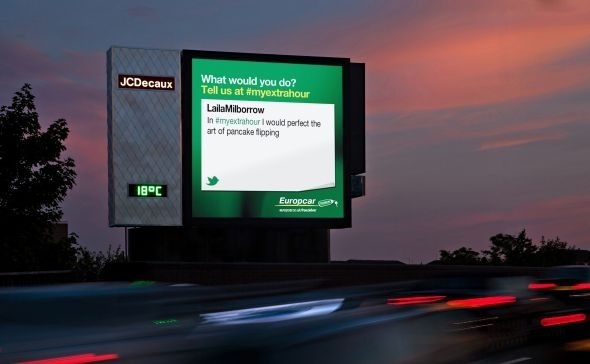 The static posters drove people to twitter, but in turn their tweets were being displayed on Digital 6 sheets and billboards across London allowing consumers to broadcast their ideas for how to spend their spare time. I also thought that this was a pretty brave approach and at least they are trying to do something a bit different. It definitely stands them apart from their competitors. 5) One guy who was using it to send people to a competitor site (enterprise) and lots of people re-tweeting the “Corporate Twitterbot FAIL” that ensued. In total since Saturday there have been about 60 tweets, and I can’t find one that is from an actual member of the public who has engaged with this campaign in a non-cynical and genuine way. This a) makes me happy because I was right and b) makes me sad because I was right. I just don’t think that a brand like Europcar which has no defined brand identity or personality (or none that exists outside of their own marketing team) can drive a social media movement in this way and expect people to actually bother engaging. We are a cynical bunch, particularly in London and we won’t be told what to think, what to share or how. Fundamentally people don’t have an overwhelming urge to engage with advertising campaigns and to get them to do so you need to deliver a great deal more value to them than this campaign does. Whenever I look at campaigns like this I revert to my standard motto which is “what does the consumer actually get out of this”, and in this case, I really have no answer. I also think that if you insist on trying something like this you need a much clearer call to action and use a media that can really bring “an extra hour” to life in an emotionally engaging way. This seems to be crying out for a full-on “Bisto” style emotional TV treatment that might just cut through our cynicism, bring a moment of laughter, joy, nostalgia, etc into people’s lives and maybe, just maybe get people to share some truly inspirational and worthwhile thoughts.